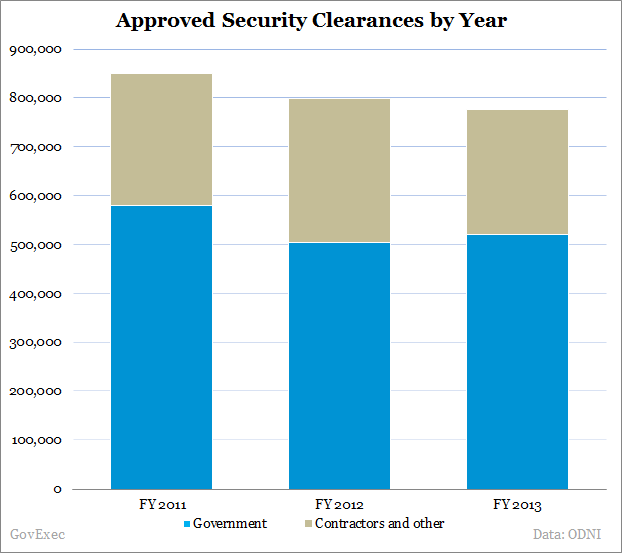 In just a few months beginning mid-2013, the American people’s confidence in the federal government’s ability to administer security clearances was upended. First, cleared contractor Edward Snowden leaked thousands of pages of classified data on the National Security Agency’s surveillance activities. Then contractor Aaron Alexis fatally shot 12 people at one of the most protected government facilities in the country: the Washington Navy Yard. Alexis had a security clearance despite several potential red flags, including a history of mental health problems. In the year since Alexis’ shooting rampage, lawmakers have been practically stepping on each other’s toes with proposals to fix the security clearance process. Bills have been unveiled, investigations launched, commissions formed, recommendations released and processes overhauled. Still, government leaders lack a uniform vision for reform, and the one common refrain from the president to law enforcement officials to members of Congress is that more work remains. Obama has signed into law two proposals stemming from the post-Snowden, post-Alexis era. The first was the fiscal 2014 National Defense Authorization Act, which established a task force to enhance coordination and cooperation among federal background checkers and state and local authorities. The task force issued recommendations to improve information sharing, but those recommendations have yet to be put into practice. In February, Obama signed into law an act that allowed the Office of Personnel Management’s inspector general to use its revolving fund to investigate cases in which the integrity of a background check may have been compromised. That reform, which cleared both chambers of Congress unanimously, was designed to give OPM -- the agency which since 2004 has maintained primary responsibility for doling out security clearances -- more oversight authority over its own investigations. Lawmakers viewed those changes as starting points, not solutions. 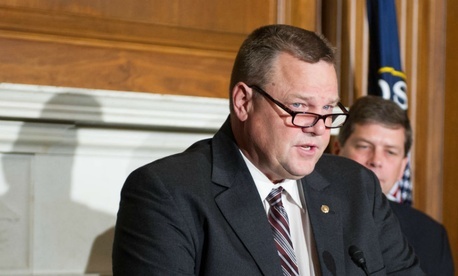 Sen. Jon Tester, D-Mont., who sponsored the OPM IG Act and has championed security clearance reform, continues to look for ways to attack the problem. Part of that work includes introducing the Security Clearance Accountability and Reform (SCARE) Act, which would prohibit federal employees found guilty of compromising the integrity of a background investigation from conducting future investigations, and would make the manipulation a fireable offense. The bill was introduced with bipartisan support, including from Ohio Republican Sen. Rob Portman, and cleared a committee, but has yet to receive a vote on the Senate floor. Most parties identify over-classification of documents and overzealousness to give out security clearances as key barriers to a properly functioning security clearance process. The logic goes thus: too much classified information creates demand for too many individuals needing clearances, which puts pressure on investigators to emphasize quantity of background checks over quality. Currently, about 5.1 million individuals hold security clearances, about 40 percent of whom do not ever access classified information. In total, the federal government spent about $11.6 billion on its security classification and clearance system in fiscal 2013. Tester’s SCARE Act attempts to address that issue, as does the Clearance and Over-Classification Reform and Reduction (CORRECT) Act, introduced by Sen. Ron Wyden, D-Ore., and Rep. Bennie Thompson, D-Miss. The bill would codify an Obama administration initiative to reduce the number of people with clearances by 10 percent within five years, and attempt to more closely tie the need for security clearances to positions that require access to classified information. In the immediate aftermath of the Navy Yard shooting, Obama tasked the Office of Management and Budget, in conjunction with OPM; ODNI; the Homeland Security, Justice and Defense departments; and others with crafting a Suitability and Security Process Review. After 120 days, the panel came up with 13 recommendations, broken down into three main categories: increasing the availability of information to improve decision making, reducing the inherent risk in the current security clearance process and developing holistic, enterprise solutions to clearance operations. Some of the concerns have been addressed, while lawmakers continue to seek solutions to others. Several recommendations attempt to improve the ongoing monitoring of cleared workers to ensure the proper alarms are sounded when, for example, a cleared employee checks himself into an emergency room for mental health issues. A proposal from Sen. Susan Collins, R-Maine, would require OPM to reevaluate clearance holders at least twice every five years through an automated and random review of public records and databases. Currently, secret security clearance holders are reevaluated by a human investigator every 10 years, while top secret holders are reevaluated every five. The automated reviews would search typical databases such as court records, as well as previously uninvestigated tools such as consumer reports and individuals’ Facebook and Twitter pages. Collins’ Enhanced Security Clearance Act, introduced with bipartisan support, has passed a Senate committee and Rep. Mike Kelly, R-Pa., has introduced similar legislation in the House. The Obama administration has launched several pilots of its “continuous evaluation” program, which aims to evaluate clearance holders more frequently. The Pentagon has successfully implemented the program to some of its cleared workforce, and the White House expects the program to be fully implemented for the “most sensitive populations” in fiscal 2016. The Wyden-Thompson CORRECT Act includes several provisions to address privacy concerns for employees subject to continuous evaluation programs. Greg Rinckey, a managing partner at Tully Rinckey, a law firm specializing in security clearance issues, said the key to reform is two-pronged: reduce the number of people with clearances, then increase the number of reinvestigations. “The more people holding security clearances the more the chances for a breach,” he said. The OMB report also called for better oversight and metrics to review the investigations conducted by contractors. In February, the Obama administration moved to bring the previously outsourced final review of background checks in-house . More recently, the Office of Personnel Management decided not to extend a contract with USIS, the largest private-sector background investigator and the company responsible for both Snowden and Alexis’ clearances. But in a rebuttal of recent criticisms , USIS noted that its investigations of both Snowden and Alexis were complete. Tester also introduced the Preventing Conflicts of Interest with Contractors Act, which passed the Senate earlier this month. The bill would prohibit a contractor from conducting a quality review of its own background checks. While lawmakers’ plans are largely abstract, the White House has taken some concrete actions. OMB recently said it will shift all individuals with clearances to a five-year schedule, regardless of level. To meet the 10 percent reduction goal, ODNI is requiring all agencies to “review and validate” whether each individual with a clearance actually needs it. OMB is coordinating a governmentwide, metrics-based evaluation of meeting security clearance objectives. While most of the information is classified or not yet available, the Performance.gov statistics show the government is, for better or worse, processing clearances more quickly. The fastest 90 percent of investigations for secret clearances took an average of 46 days as of April 2014, while top secret took 109 days. The same category of investigations in aggregate took 265 days in 2005. 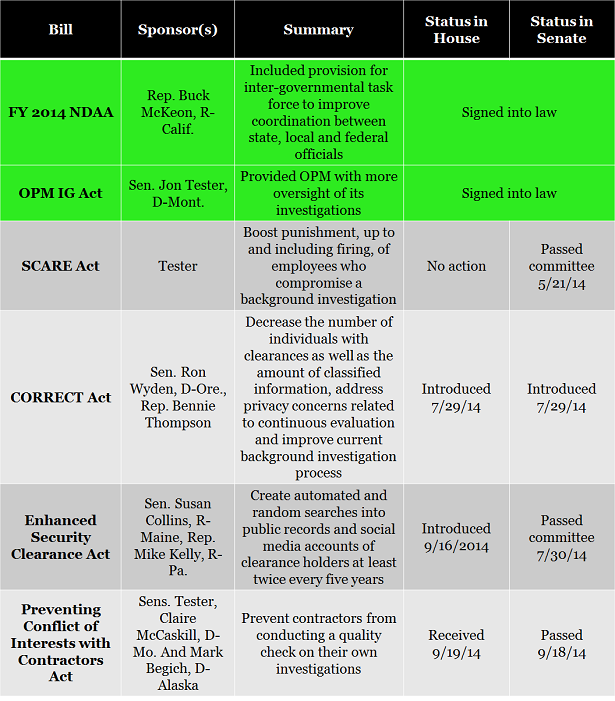 In addition to the proposals already put forward, government audits point to gaps in the security clearance process. A Government Accountability Office report issued earlier this month found inconsistencies in how agencies revoke the clearances, as well as in the punishment clearance-revoked employees receive. A July GAO report found 83,000 tax delinquent Defense employees and contractors owed the government $730 million . Congress is recessed until the November elections, at which point it will face a limited schedule and an already full agenda. If lawmakers fail to take on a larger reform bill during the lame duck session, it will be back to the drawing board in 2015. Malessa added: “You can expect more attention on this issue from Sen. Tester.” Whether his colleagues show similar enthusiasm remains to be seen.